Edit an existing published workbook and add worksheets for views, dashboards, and stories. Create and edit a new workbook based on a published data source. Edit an existing published workbook and add worksheets, and also connect to different published data sources while editing. For details, see Connect to Published Data Sources while Web Editing. Sign in to a site on Tableau Online or Tableau Server. Either open the project that contains the data source you want to use, or show All Data Sources. Click the … next to the data source name to open the actions menu, then click New Workbook. 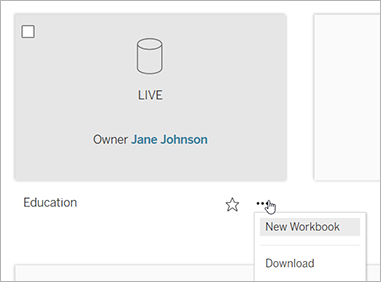 A new, blank workbook opens in the Tableau Server web editing environment. Sign in to a site, then either open the workbook that contains the view you want to edit, or show All Views. Click Edit in the view toolbar. When you click Edit, the view opens in web authoring mode. Now you can edit the view. To get started, see Build common chart types on the web in this article. Also see Step 4 in Creators: Get Started with Web Authoring and Explore and Analyze Data in a View. The Save options available to you will vary depending on your permissions set by your Tableau site administrator. To close the view without saving your changes, select File > Close. To save your work in the current workbook, select File > Save. To save your work in a new workbook, select File > Save As. This section describes how to build three different types of charts in views. 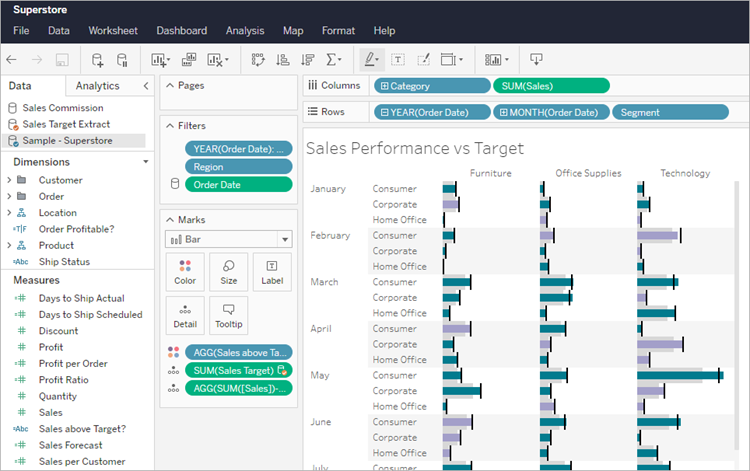 These examples use sales data from the Sample -Superstore data source available in Tableau Desktop. This procedure shows how to build a bar chart view that displays a list of technology products and how much profit each has generated. Under Dimensions on the Data pane, drag Category then Sub-Category to the Columns shelf. From Measures, drag Profit to the Rowsshelf. Click the image to replay it. Tableau now has enough to convert the data into a visualization (view), in this case, a horizontal bar chart. To display only the items under Technology, click the Technology header and select Keep Only. To display each bar as a separate color, drag Sub-Category to the Color card. As a final touch, click the Color card to edit the color palette and assign the Blue palette. Right-click the sheet tab, click Rename Sheet, type Bar Chart, and then click OK. This procedure shows how to create a table that lists product profits by category and uses color to highlight the range of sales sizes. Create a new sheet by clicking the New worksheet icon. From Dimensions, drag Segment to the Columns shelf and Category and Sub-Category to the Rows shelf, then drag Profit to the Text card. Your view now displays profit data in a table. Add color to your table by dragging Profit to the Color card and changing the Marks type to square. Your view now displays data about profits in a table that uses color to highlight the different sales amounts. Give the view a name by right-clicking the sheet tab, clicking Rename Sheet, and typing Highlight Table. Click OK. This procedure shows how to create a map view from the Sample -Superstore data source. This view will show profits by U.S. state. On the Data pane, double-click the Statedimension, then under Measures, double-click Profit. On the Show Me menu, click Maps. Tableau looks for geographic fields in any data source. For more information on how Tableau interprets geographic data in data sources, see Assign Geographic Roles in the Tableau Help. Give the view a name by right-clicking the sheet tab, clicking Rename Sheet, typing Map. Click OK.